What terrible weather in the capital today. Not to worry: I have discovered a gorgeous wee tea room in the heart of Canongate sure to warm you! Clarinda’s Tea Room, towards the bottom end of the Royal Mile is not new in itself, but new to me and has actually been trading from the same premises since 1976. The small but perfectly formed cafe is jam packed with fancy china, frilly doilys and spindly furniture. Like the Mad Hatter’s tea party you seem to enter another world as you enter from the High Street. 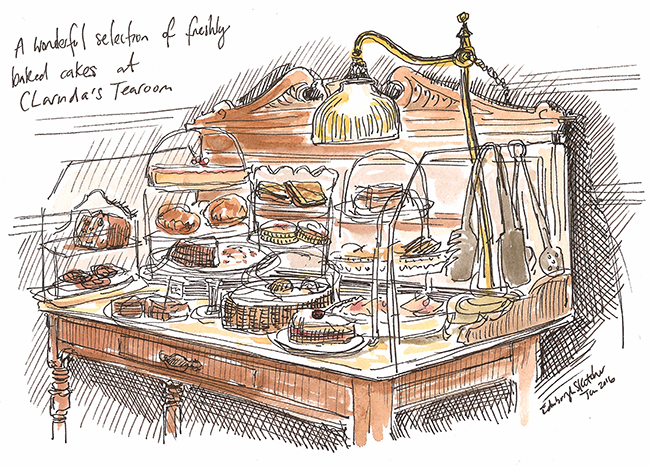 The sketch above is from their fully laden stand of cakes and biscuits, all freshly baked on the premises. The staff are so welcoming that I will be sure to pop in for a cuppa again soon, and am thankful of today’s downpour for helping me make the discovery. Sketch created with black fineliner and watercolour wash.
Clarinda’s Tea Room Facebook page.